Big Band Library: August 2015 "Big Band News"
AUGUST 2015 "BIG BAND NEWS"
In March 2011 when the 2-CD set “75 Glenn Miller Masterpieces” (Sepia 1165) was created by combining a keepsake album of some of his finest broadcast performances, “For the Very First Time” (RCA Victor LPM-6100), with a dozen choice tracks from two landmark “Limited Edition” anthologies (RCA Victor LPT-6700 and 6701), fans were delighted. Now, in response to requests from around the world, the remaining 80 wonderful airchecks from both “Limited Edition” sets have been gathered for this new, 3-CD package. Included are hits like Sunrise Serenade, A String of Pearls, and American Patrol, as well as collector’s favorites such as Under a Blanket of Blue, The Hour of Parting, and Bugle Call Rag. Dates of the performances range from 1938 to 1942. This is some of the original Miller music that collectors around the world have been asking for, and, unfortunately, Sony Music Entertainment, which absorbed RCA in 2004, thus far has shown little or no interest in reissuing it. After all those Miller records we purchased over the years from RCA and related labels (often with the same songs ad nauseum), they seem to have abandoned us. So here’s the best possible alternative, in remastered sound with original artwork and other archival images, and, actually, improved over the old LPs with its own beautiful new cover, the production history and little-known trivia about the “Limited Edition” albums, and a discography which corrects many names, dates, or other details. Those qualities alone should cinch the purchase of this set. 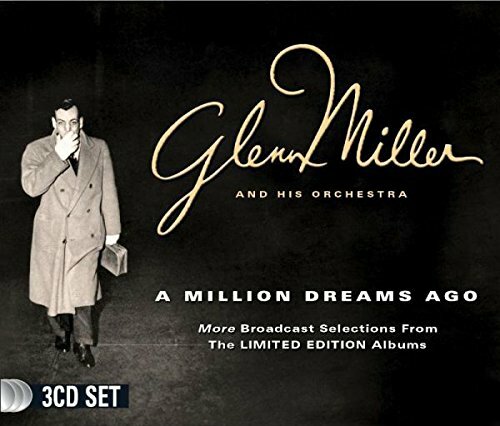 If you’re a serious Glenn Miller fan - whether you grew up with his music long ago or are a young person now discovering his sound – you’ll want this! All of it has been done with loving care, believe me. Big Band Library rating: You’ve been waiting for this one! Larry Elgart. “Bobby Scott: Joyful Noises / Larry Elgart: The City,” El (E) Records. want one of Elgart’s MGM albums. a must-buy, unless you are an Ellington completist. three takes each of Alerado and Afrique, showing Ellington creativity at work. Trio,” Halcyon (E) 147. Music from September to November 1935.
a leading British recording and remastering engineer, Michael J. Dutton. autumn 1946, such as Five Minutes More, Oh! But I Do, and Seems Like Old Times. Stan Kenton. “Stan Kenton ‘live’: His Artistry And Rhythms,” Mr. Music MMCD7042. and label owner Wayne Knight. It’s hard to believe that Van Alexander turned 100 this past May but, unfortunately, died on July 19th of natural causes (as I included in last month's "News.") What isn’t surprising is that he’ll be formally saluted at a dance on the 12th of this month at Maxwell DeMille’s Cicada Club at the Oviatt Building on South Olive Street in downtown Los Angeles – he surely deserved that honor! Alexander was one of Chick Webb’s arrangers before starting his own band in the late 1930s. It was he who composed A Tisket, A-Tasket, one of Webb’s classics which featured young Ella Fitzgerald on the vocal. On the bandstand at the centennial dance party will be The George Gee Swing Orchestra. Gee comments, “Van Alexander’s legacy with the Chick Webb orchestra, Ella Fitzgerald and the Savoy Ballroom is so important. Van is a true bridge to the classic Savoy style big band of Harlem from the 30s and 40s . . . He came to our ‘Battle of the Big Bands’ in Culver City (CA) last summer and was thrilled and awed by the modern day community of lindy hop and big band enthusiasts. Alexander had planned on attending the show as their special VIP honoree, but at least he knew that the celebration was in the works. Besides A-Tisket, A-Tasket, the live music that night is expected to include Let’s Get Together (Chick Webb’s theme), transcribed from the original recording. More details are on cicadaclub.com. Now through August 31st, The SoHo Playhouse in New York City is presenting “Bombshell of Rhythm: The Life & Secrets of Ina Ray Hutton.” The show was previously done in Los Angeles, Chicago, Las Vegas, and Washington, DC and won a “Pick of the Fringe” award. “Bombshell of Rhythm” is a dramatic, one-woman biographical theater piece by Melissa Ritz, telling the story of Hutton, who was an underrated and often-overlooked female pioneer of The Big Band Era. As Ritz explained to me, "the more research I did on Ina, the more respect I had for her. She was fighting for equality in a man's world of jazz music in the 1930's, 40's and 50's. She was a pioneer for women in entertainment and didn't take 'no' for an answer." Music heard during the show includes tunes once performed by Hutton such as I’m a Hundred Percent for You, Earthquake, Truckin’, Jazznocracy, Organ Grinder’s Swing, Doin’ the Suzi-Q, Was It Worth It?, and Five O’Clock Whistle. How did it make Ritz feel to win the "Pick of the Fringe" award? "It was a beautiful surprise," she acknowledged. "It feels nice to be recognized or the hard work and long hours that I've put into the show. Not just for me, but for my design team as well. It's never really a 'solo show.' There are numerous designers involved, and my director is a big reason why the show has received these accolades." "I'd also like to add a request that people get out to a theater and support live artists," Ritz commented. "Turn off the TV and go see a show...a reading...a performance. See where work originated and track its evolution. And if you feel inspired by someone, support them and get their name out." A year-long celebration of the legacy of the late drummer-bandleader Louie Bellson, which began last July with the 90th anniversary of his birth, is winding down. Bellson (1924-2009), recipient of a prestigious American Jazz Masters Award from the National Endowment for the Humanities in 1994, was once called the “world’s greatest musician” by Duke Ellington, for whom he worked at various times in the 1950s and ‘60s. He also played drums on other occasions for Benny Goodman, The Dorsey Brothers, Harry James, and Count Basie. And, of course, he led his own band for many years. His widow, Francine, has done an admirable job keeping his name in front of music fans; during the last 12 months, a new book about Italians in jazz, Bebop, Swing and Bella Musica, by Bill Dal Cerro and Anthony David Witter (Chicago, IL: Bella Musica Publishing); and concert tributes, exhibits, displays, and radio programs all in Bellson’s honor. Of course, the official Bellson website celebrates his life and career with a variety of information, including, for example, copies of some of his big band’s arrangements, such as Skin Deep and The Hawk Talks, available for purchase, and video footage of Bellson himself talking about his drumming and music. leader of T Dorsey Orch ’66-’67. Frank Capp, b.Aug 20, 1931. Drummer with Kenton ’51; Hefti ’52. Claude Hopkins, b.Aug. 3, 1903. Pianist - leader of own band. T Dorsey ’44. Leader of own band. Luis Russell, b.Aug. 5, 1902. Pianist with Armstrong ’35-’43. Leader of own band. record label owner - producer (Clef / Verve / Pablo). Warren Covington, b.Aug. 7, 1921. Trombonist with I Jones ’39; Heidt ’43? ; Brown ’46?. Leader of T Dorsey Orch ’58-’61. Leader of own band. Freddie Slack, b.Aug. 7, 1910. Pianist with J Dorsey ’36-’39; Bradley ’39-’41. Benny Carter, b.Aug. 8, 1907. Leader of own band. Arnett Cobb, b.Aug. 10, 1918. Tenor saxophonist with Hampton ’42-’47. band ‘42. Leader of own band. '31-’34; Carter ’34; Teddy Hill ’34-’38; Kirby ’38-’45; Ellington ’46-'61 / '61-'74. Joe Puma, b.Aug. 13, 1927. Guitarist with Shaw ’53; Bellson ’54?. Frank Devito, b.Aug. 14, 1930. Drummer with DeFranco ’49 / ’51. Redman ‘30s; Armstrong ’41-’46?. Composer of Leap Frog and In the Mood. Al Hibbler, b.Aug. 16, 1915. Vocalist with McShann ’42; Ellington ’43-’51. Dorsey Bros ’34; G Gray ’35-’36; T Dorsey ’37; Berigan ’37. Leader of own band. for Lunceford ’42 / ’45-’47. Brown ’50-’54 / '60s / '70s [ not continuous ]; Crosby ’54-’57. Out); Miller (Slip Horn Jive, Glen Island Special, Wham). Joe Haymes ’34. Arranger for Goodman; G Gray. Krupa ’48-’49; Pastor ’49; Auld ’51; Kenton ’52-’54. Joya Sherrill, b.Aug. 20, 1927. Vocalist with Ellington ’44-’48 / ’57. Armstrong ’47-’51. Leader of own band. Count Basie, b.Aug. 21, 1904. Pianist with Moten ’30?-’35. Leader of own band. Bob Crosby, b.Aug. 23, 1913. Vocalist with Dorsey Bros ’35. Leader of own band. [ not continuous ]; Barnet ’46-’47 / ’52-’53; Oliver ‘50s. Parade, Monotony in Four Flats); Barnet ’44 (incl Skyliner). ’52-’53 / ’74. Married Hefti ’45. Peter Appleyard, b.Aug. 26, 1928. Vibraphonist with Goodman ’71-’77. Lester Young, b.Aug. 27, 1909. Tenor saxophonist with Kirk; Basie ’36-’40 / ’43-’44. Dinah Washington, b.Aug. 29, 1924. Vocalist with Hampton ’43-’46. Willie Bryant, b.Aug. 30, 1908. Leader of own band. Edgar Sampson, b.Aug. 31, 1907. Saxophonist with Ellington ’27; F Henderson ’31-’33. Don’t Be That Way, Lullaby in Rhythm. CA; Aug 28, State Theatre, Red Bluff, CA; Aug 29-30, Yoshi’s, Oakland, CA. In next month’s “News,” the great work that a university is doing to preserve the legacy of one of the big band titans. And how a music society is trying to save the collection of a longtime fan.